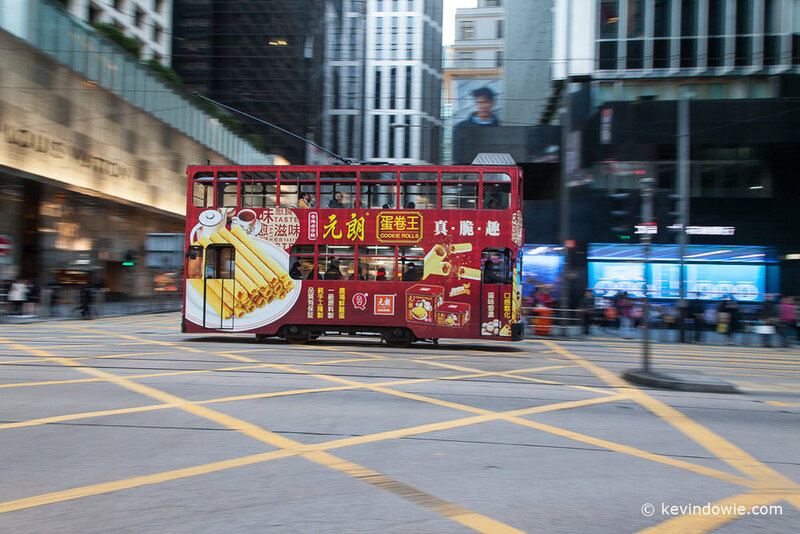 Returning to Hong Kong earlier this year, I was delighted to see that their iconic double decker trams are still in regular use. Living in Melbourne, I am of course familar with tram services, my home city having a real attachment to this form of public transport. 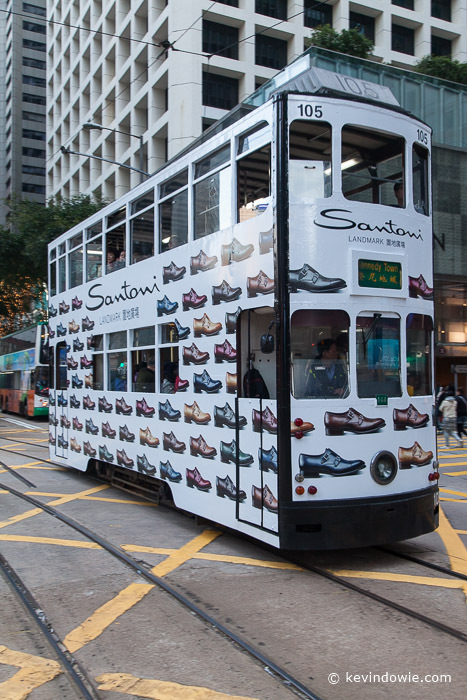 However Hong Kong is, to my knowledge at least, the only place which has double decker trams, a result no doubt of the many years of British influence there. These vehicles, in addition to being environmentally friendly, lend themselves to wonderful, colourful, decoration with advertising images and slogans. Each tram is a mobile work of art. I found myself photographing them during the late afternoon and evening, using slow shutter speeds, with and without panning, to try and give a sense of movement. With the camera on a tripod and a slow shutter speed used, other vehicles moving past registered as light trails. With slow shutter speed and panning, the tram moves through a blurred cityscape. This technique, which I discussed before, is fairly hit and miss but can result in pleasing effects. Above, a slow shutter speed and deliberate camera movement gives a more abstract feel to simple tram tracks. As readers may have detected by the recent flurry of activity, I'm making a determined effort to complete the processing of my Hong Kong images. I anticipate another 3 to 4 blog posts in the coming week or so, following which I'll put together a fairly extensive image gallery. Then I can make a real start on my many images from Japan, also captured earlier this year! Although few people make comments here on the blog, I've had a good deal of positive feedback via social media and in person as well. Thanks everyone for the support, and a reminder again that I'm now putting out a "semi-regular" newsletter with links to updates. If you haven't already done so, consider subscribing! ~KD.